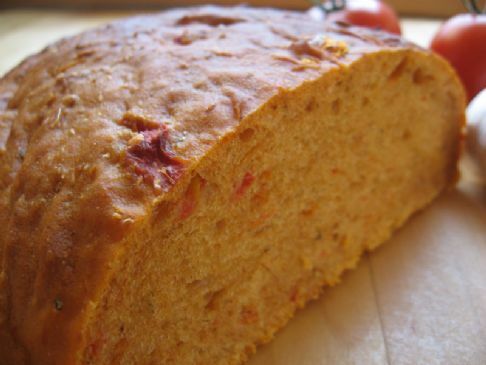 Buy this bread at our local Amish Farmers Market and this recipe is out of their cookbook. Buy this bread at our local Amish Farmers Market and this recipe is out of their cookbook. 1 C warm water, 6 T sugar, 1 1/2 T yeast, 1 1/2 C olive oil, 1 T salt, 1 C tomato sauce, 2 C tomato juice, 1 T oregano, 1 T basil, 2 tsp garlic powder, 8-9 C flour. Soften yeast in warm water mixed with sugar. Add oil, salt, tomato sauce and tomato juice that has been warmed to lukewarm. Add spices and 2 cups flour, stirring well. Add enough more flour to make a soft dough. Knead until smooth and elastic. Let rise until double in bulk. Punch down, let rise again until double. Shape into loaves and place in pans. Let rise until double. Bake at 350 degrees for 1 hour. Brush with butter while still hot. Yield 3 loaves. Recipe submitted by SparkPeople user JEHILDE.